Suitable for use either in a conservatory, on the patio or in the garden, this stylish dining set from the Winchester range features an attractive weatherproof round rattan weave. 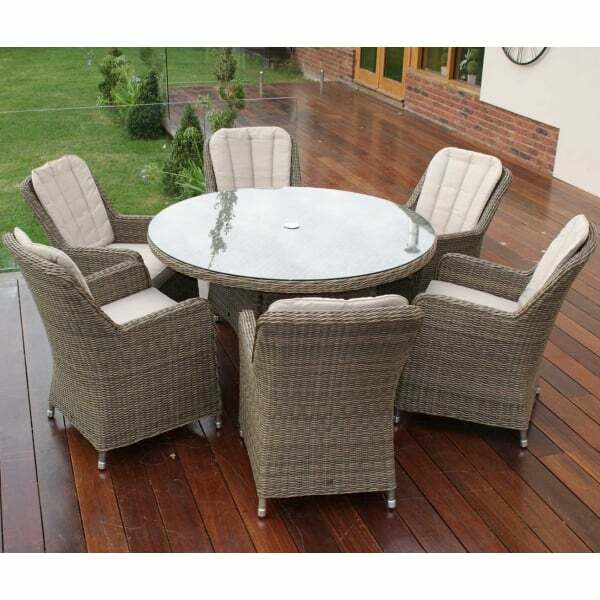 The six chairs include comfortable seat and back cushions and beautifully compliment the 120cm diameter round dining table which has a tempered safety glass top making it easy to clean The round table also features a parasol hole which enables you to purchase an optional parasol to protect you from the summer sun when using this set outdoors. This rattan dining set benefits from a rust resisting aluminium frame and weatherproof synthetic rattan and includes a 1 year manufacturer’s warranty.